After posting on 4/30 that the Texas Senate had passed a Bill regulating sand mining on the San Jacinto, bad news. The Bill died in the House. I had thought it was pretty much a done deal, but I learned something about politics - it's not over until the bill is signed into law. It was the end of the legislative session and the Bill simply did not make it out of Committee onto the floor to be voted on. I am extremely frustrated with how difficult it is to even find out about what is going on in the legislature. Even though Jennifer Lorenz of Legacy Land Trust had regular contact with the Senator's office that supported the Bill, it was not something the public knew about, and it's like a sleuth hunt trying to figure out when the bill is in Committee or being voted on. All I can say is, maybe next session. What's ahead: Next weekend I am paddling the 10-mile Neches River Rendezvous through lush bottomland hardwood forest, and then heading up to interview some people about the Neches National Wildlife Refuge, currently embroiled in a lawsuit, basically Dallas wants to build the Fastrill reservoir right over the top of the refuge. The kids got out of school for the summer and are already bored! Ha ha! I told them I'd give them more chores if they wanted... I'm so proud of my babies - they were the only two kids in the entire school to get "Superior Achievement Award" which means they earned a 95 overall average for the year, with no grade below a 90 in ANY subject - including math, science, literature, history, Spanish, Art and PE - all year! Last year, Savannah was the only student in middle school to get the award and now that Sam is in middle school, he got it too! At the beginning of the year, I told Sam I'd buy him a Robo Sapien if he got the same. And he did! Two Christmases ago, we laughed so hard in Radio Shack over the crazy antics of this large white robot. It costs a small fortune! Had a great trip camping with Sam's 5th grade class. 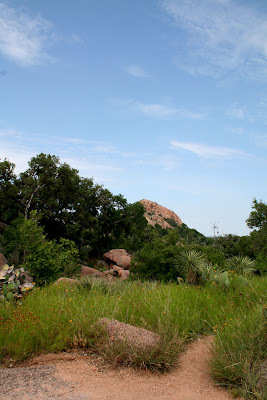 We stayed at Colorado Bend State Park, and took a day trip to Enchanted Rock State Park. It was a wonderful experience because it challenged so many fears of the kids. The first day we tromped through these spring-fed water holes with slippery rocks, muddy bottoms and algae - but they were beautiful with lots of little waterfalls. Some of the kids did not like the mud and algae but all went through everything anyway. 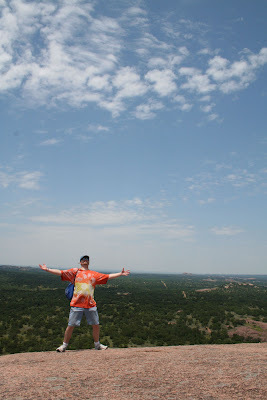 The next day, hiking up Enchanted Rock was awesome. 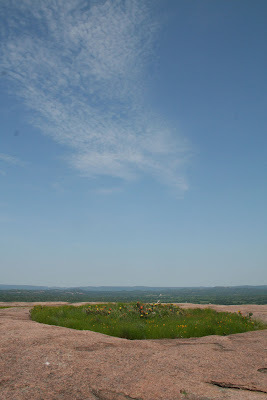 I'd been there before, in fact I wrote about it in a story called Top of Texas for Texas Parks & Wildlife magazine. Sam and another couple of boys were truly terrified they would fall down the rock! It's a steep walk, but it's not rock climbing that we did - just a steep hike up a giant granite batholith. I encouraged Sam and another boy to overcome their fears, and just put one foot in front of the other. They didn't want to look backwards, and they didn't want to go forward at one point, but they did it, and by the end they climbed down just fine. We also clambered through some "caves" made by giant granite boulders and this was a bit scary for me! Several kids were scared at this point too, but we all did it - every single one! They were saying things like they overcame all their fears. ;) It was cute. That afternoon, we drove back to CO Bend to our camp and "swam" in the Colorado River which had a very swift current but was pretty shallow. I stayed downstream because I was really worried some of the kids would lose their footing and float downstream beyond me or the other parents and Mr W. In fact several kids did lose their footing and I had to grab them, because they would sort of panic and lose their wits. We then went on a night hike and saw a deer and its spotted fawn (only a couple of us saw it) and several armadillos. Later, we looked at the stars. The first night it was partially cloudy but I showed Sam and his friend the stars both nights. I brought my star chart with me! We made Smores the 2nd evening - my favorite!! Here are a few photos. 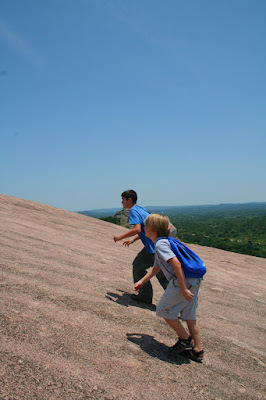 Overcoming fear... on a steep hike up Enchanted Rock! A beautiful view on the way. 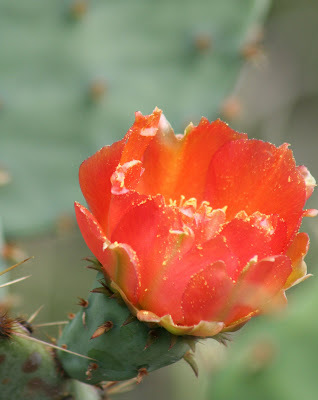 A brilliant orange prickly pear cactus flower. These little depressions at the top of Enchanted Rock get filled in over many years with dirt, allowing plants to grow. Fairy shrimp live in some of them also. Mr. W "falling off the rock." 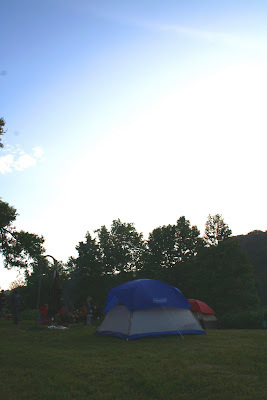 The campsite. 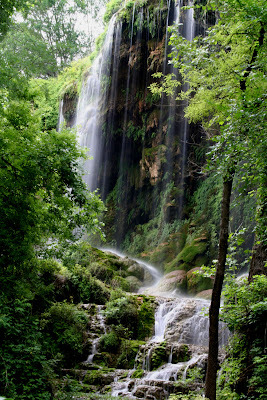 Gorman Falls at Colorado Bend State Park. We hiked here the 3rd day, before heading home. Sam sitting by the Colorado River. I traveled down to University of Houston campus to record my first podcast at the KUHF studios. This was a podcast where I was interviewed by OnEarth magazine editor Laura Wright about my article that will appear in their upcoming Autumn issue about The Compact, a movement to stop buying new "stuff" to combat the negative environmental impacts of consumerism. Recording is always fun, and I've definitely gotten more comfortable the more times I do it. The first time I was God-awful! Anyway, I'll link to the podcast when it appears online, probably in a few weeks. 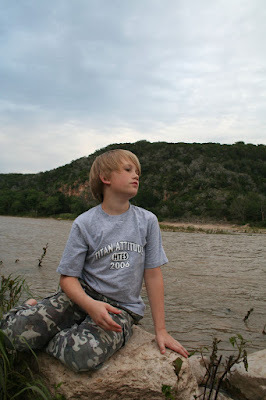 I'm heading to Colorado Bend State Park with Sam and his 5th grade class tomorrow for a 3-day camping trip. Should be fun! Oh look! My article on koalas "Will Urban Sprawl K.O. the Koala?" is out in the latest National Wildlife magazine. It talks about how they have koala ambulances and a crew of volunteers that rescue koalas hit by cars. Cool beans. I also interviewed Dr. Jon Hanger from Steve Irwin's Australia Zoo's Wildlife Hospital. I just got back from L.A. where I went to Paige and Hugh's awesome unique wedding, and also met a lot of really cool people! While there I visited with my 2nd cousin Daria, and met up with writer friend Judy Stock (who I've known virtually for probably 10 years but never met) and also fellow blogger and artist Wendee who posts comments here regularly! :) We had a great time. I will post photos soon. Meanwhile I haven't posted here as much because I've been posting to my Fish Wars blog so take some time and go visit it!